Working directly with your students in school, our film making workshops give your students a chance to demonstrate their learning and knowledge in a whole new way. Film making workshops can be part of a Partnership Plan, or delivered as a stand alone workshop. 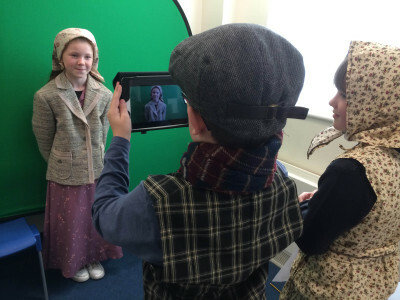 Curriculum linked film making enables students to really engage with their learning. There are lots of elements to the film making that are supported by traditional learning methods such as script writing and storyboards. The research is carried out by the students using both traditional and 21st century methods. The students are able to demonstrate where their strengths lie, whether in script writing, acting, filming or directing. The confidence of the students grows throughout the process, which is apparent in the Roman video, where the actor is nervous to begin with, but his confidence soon grows throughout the filming process. Students develop a wide range of skills, from communication and collaboration, to researching and presenting, all in a fun and engaging way. Here are just some of the videos created by students during film making and green screen workshops. The students researched their subject, and created their own storyboards and scripts. They filmed and edited their own group videos, which were then presented. Within their groups, children allocated roles and each member of the group performed their role whether it was filming, directing or acting. Using number of apps collectively, in this video the students explain the history of the Romans in Doncaster, followed by a news report of an interesting sighting. The group chose to have just one actor in the video, whilst the others in the group worked on the script, editing, effects, filming and directing.